Having trouble with little ones falling asleep? 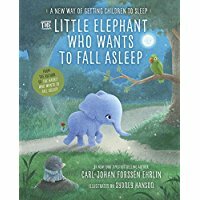 If so, check out Carl-Johan Forssén Ehrlin’s new book The Little Elephant Who Wants to Fall Asleep, which is a follow-up to his #1 international bestseller, The Rabbit Who Wants to Fall Asleep. This book is actually a longer than expected picture book story following Ellen the Elephant on a journey through a magical forest that leads to sleep recommended for ages 3-7 (preschool to 2nd grade). In this unique sleepy book, there are words in BOLD to be emphasized by the reader and also there are emotions highlighted for the reader to yawn as recommended to help along the sleepiness of the story. In the back of the book, there were also “Tips from the Author” on sleeping and “Success Factors” to take into account when reading this book to your youngster. If your household is struggling with nighttime routines or downtime to fall asleep in a timely manner, The Little Elephant Who Wants to Fall Asleep, may be a perfect addition to your family library to smooth out bedtime. This book is also available as an audiobook with soothing voices, which may also be a great option for your family. The Little Elephant Who Wants to Fall Asleep can be purchased at Amazon, Barnes & Noble and anywhere children’s books are sold. Get your copy today! Carl-Johan Forssén Ehrlin is a behavioral scientist with a bachelor’s degree in psychology and teaches communications at a Swedish university. He is also a life coach and leadership trainer. Carl-Johan has combined all of these skills and experiences in developing the techniques in this book. Read more about the author at carl-johan.com or on his Facebook pages: Carl-Johan Forssén Ehrlin and The Rabbit Who Wants to Fall Asleep.